Review: A couple with three grown up children live together in an isolated house. There over-protected parents say they can only leave when their dogtooth falls out. The father convinces his children that the world outside the house is deadly. Not a very old film but already classed as a modern cult classic. I could say that this is pitched halfway between horror and satire. This is a very disturbing film. One example of this is when a pair of shears is used to attack a cat. On the BBFC website it states that rubber shears were employed and that no animals were harmed. This director has been compared for his work to the likes of Haneke, Kubrick and also Lars von Trier. In this film the children’s names are never given and also the family have no name. This includes a father, a mother, two sisters and a brother. On the cover of the DVD it states that the film is disconcertingly funny, I did not laugh once. The late film critic Roger Ebert described this film as “There is this. 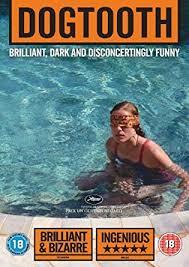 “Dogtooth” it is like a car crash, You cannot look away”.